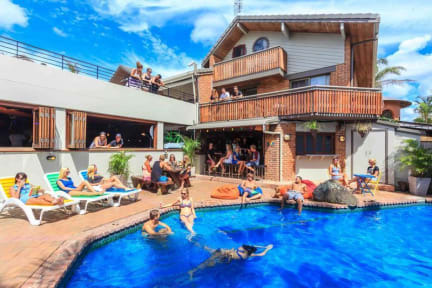 Would recommend this to all solotravellers, most social hostel i’ve ever stayed in. Free meals every evening and the cheap hostelbar makes it even better! Would go back here 10/10. very nice hostel! Close to the beach and city, vouchers for free drinks at several bars in Byron and friendly people :) Only the free dinner was a bit small, so prepare for a second dinner! Had the most amazing time ever in Aquarius. Free dinners and overall amazing vibes. Booked for one day, ended up staying for eight. No words for this place. Awesome!!! Very cozy and good food for the price! It's not quiet in the night but that's what you chose for! This is a really nice hostel with free diner sometimes as well. A little bit more of a party hostel, but that makes it also more cosy. Perfecte locatie, leuke sfeer, vriendelijk personeel, warm welkom, avondeten was minder maar het vult je maag en het is toch gratis. De kamer is ruim, wordt iedere dag bijgehouden met poetsen, er wordt niet grondig schoongemaakt. De douche is dan ook beschimmeld. Slippers aan en gaan! Ondanks de mindere douche raad ik het hostel zeker aan! Really friendly straf!! Free meal in the night and Nice areas with options for relaxing or party. Het hostel was erg vies. Badkamer was oud armoedig. Beveiliger ( Brownie ) heeft ons geweldig geholpen toen wij hem nodig hadden!